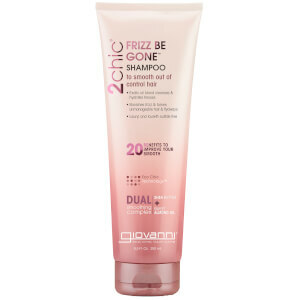 Take control of textured, curly hair with the Giovanni 2chic Frizz Be Gone Conditioner; a weightless formula infused with moisturising and hydrating ingredients for sleek, salon-worthy results. Combining Shea Butter with nourishing oils of Macadamia, Argan, Moringa and Sweet Almond, the luxurious conditioner tames frizz and flyaways, whilst improving elasticity, shine and manageability for hair that is easier to comb and style. Expect smooth, polished tresses with an ultra-glossy finish. Vegan. Colour safe. Not tested on animals. Free from parabens, phthalates, paraffin and mineral oil. Massage into wet hair from roots to ends. Rinse. Aqua (Purified Water), Caprylic/Capric Triglyceride, Behenyl Alcohol, Steartrimonium Chloride, Dicetyldimonium Chloride, Stearyl Alcohol, Cetyl Alcohol, Hydroxyethylcellulose, Glycerin, Butyrospermum Parkii (Shea) Butter Extract, Prunus Amygdalus Dulcis (Sweet Almond) Oil, *Macadamia Ternifolia Seed Oil, *Argania Spinosa Kernel Oil, *Adansonia Digitata (Baobab) Seed Oil, *Moringa Oleifera Seed Oil, *Simmondsia Chinensis (Jojoba) Seed Oil, *Cocos Nucifera (Coconut) Oil, Fragrance, Citric Acid, Phenoxyethanol, Ethylhexylglycerin.